David Campbell-Williams is a Sydney based Construction Disputes Lawyer, with 40 years of experience, in private practice and since 2011 the public sector. He has been the Deputy General Counsel of Sydney Trains since 2013. He has been closely involved in Security of Payment issues since 1999, acting as lawyer for claimants and respondents, as well as an Adjudicator. He served on the Institute of Arbitrators and Mediators Australia (now Resolution Institute) Chapter Committee for 15 years and chaired the Adjudication Sub Committee of the Institute for most of that time. 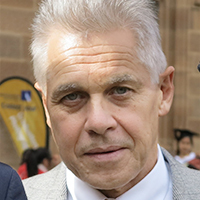 In 2008, based upon his practical experience with the operation of Security of Payment, as a lawyer, Adjudicator and trainer of Adjudicators and industry stakeholders in the Institute, he developed the Security of Payment component of the Melbourne University Law School Master of Construction Law subject Payment Matters in Construction Projects. The component takes a National perspective, with all Australian States now having Security of Payment regimes. He has taught at the subject’s annual Intensive, each year since 2008.